The www.poseidontravel-tinos.com online store accepts Visa, MasterCard, Maestro, American Express, Diners credit cards, debit cards and prepaid cards. No installment payment is possible. For purchases made through a credit card, the customer should follow the instructions he will find in this online store. On the order form he will have to fill in his credit card number and expiration date. The credit card is charged if the data and its validity are checked and verified. The customer is solely responsible for the correct recording and the truth of the credit card details. In every purchase case, the buyer should also be the cardholder used for the transaction. 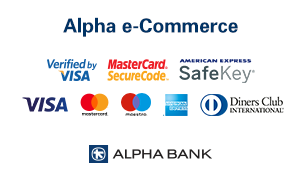 All card payments are processed through Alpha Bank’s Alpha e-Commerce electronic payment platform and uses TLS 1.1 encryption with Secure Sockets Layer (SSL) encryption protocol. Encryption is a way to encode the information until it reaches its intended recipient, which will be able to decode it using the appropriate key.